Don’t think that on the day of the event itself you can sit back and enjoy the show, there is still a great many things to do to make sure everybody in attendance is having a good time. Every event is unique, with its own long list of things to remember and keep an eye out for on the day. 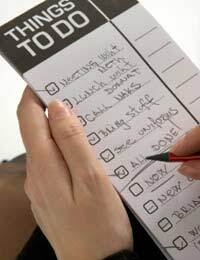 Don’t rely on your memory to keep track of it all – no brain on earth can manage umpteen things going on at once – compile a checklist of things you need to remember on the day. Even better than that, compile your ‘to do’ list in the form of a timetable, this will inform you not only what you need to do but when you need to do it. Before the event begins gather the members of staff together for a quick team talk. This should be used to as final check to make sure everybody knows exactly what they are doing. If anybody is uncertain about anything then this is time to iron out any last minute kinks. A well organised event will feature a number of attendants or stewards, whose job it is to supervise different aspects of the site, such as crowd control, the entrances and exits as well as the various attractions. Their presence should be visible but unobtrusive until necessary. Whilst the event is in progress it is important to regularly check that these vital roles are being effectively maintained. In general, supervision accounts for a large part of the event day responsibilities. As well as monitoring the stewards, one responsibility may also include making sure that the performers have everything they need, and that the star guests are being well looked after. If the event is at least partly centred on stage performance then it will be the responsibility of one person to introduce both the acts and the event itself. Whether this is a major or minor role depends on the type of event. If the occasion is motivated by a specific theme, such as a charity, political campaign or birthday celebration, then the compere has the big responsibility of reminding the guests what they are there to support. In this instance ideally the main event organiser should take the role. However well an event is mapped out in advance there are always aspects that take an unexpected turn. For this reason, if a crisis arises then the lead organiser, or ‘chair’ should always be available to make snap decisions. What happens when the special guest is late? What needs to be done when food or drink runs out? As well the stationary stewards there should be someone to regularly patrol the site, maintaining a constant line of communication between the staff and looking out for any potential crises before they take hold. The cash proceeds from the event should be carefully managed to make sure they are not vulnerable to theft and to ensure that any large quantities are kept well out of sight of the public. Metal lockable cash boxes should be used by any members of staff taking cash, and the proceeds will need to be locked up in a more secure location overnight, such as a bank or overnight safe facility. What Can You Offer Your Charity Event Sponsors?